I purchased a scarf/shawl kit from Fiber Craft Studio at Rhinebeck last weekend. I stumbled into their booth because it was an open space and then I got trapped when everyone else decided to browse too. They had really gorgeous yarn in there, and they were dyed with plants! I always love looking at other people’s successful natural dyeing experiences, thinking maybe someday I’ll end up with something that isn’t just easy yellow. Anyway, the kit I purchased contained green and pink yarn. But it was so hard to decide. Should I go with something totally unlike me or stick with what I like? The green is my standard and the pink is something a little funky. Or so I thought. Well, apparently I think that a lot. 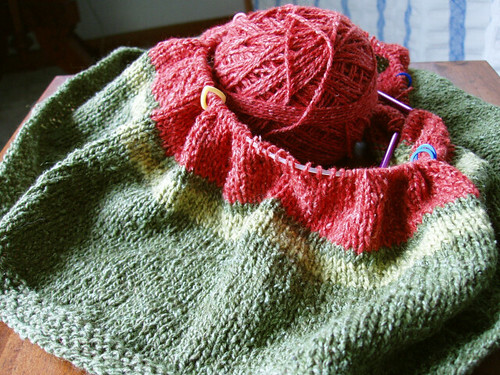 My new project looks remarkable like this camisole I made in 2009. 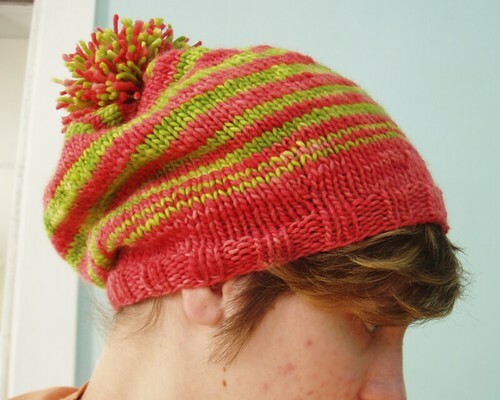 Or this hat I knit last Christmas. For someone who claims not to like pink, it seems to show up rather frequently. 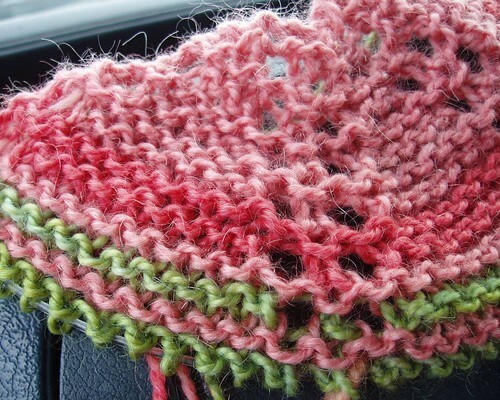 The latest pink and green incarnation is going to be a shawl. I was not so inspired by the kit pattern, so instead I decided to do a half-circle shawl using this really awesome cheat sheet. Being totally new to the shawl game, I wasn’t sure how to go about shaping them. Now I know! Mine is just totally basic with garter stitch and yarn-overs. Next time I’ll try something a little fancier. The same thing happens to me 🙂 At festivals I find myself standing there trying to force myself to buy a different color roving than what I usually buy, and even when I think Im buying something different, I come home and find the same color roving already in my stash. There is no fighting the colors that we are drawn to I guess! Glad to know I’m not crazy! I’m always trying to pick something I wouldn’t dye myself, but then I realize if I liked it and wanted it, I would dye it myself! But mostly I am trying to support other dyers, so in the end that’s the most important thing. Previous Previous post: new woolies!